Absolutely Corporate Blog Free corporate massage! Here at Absolutey Corporate we value our customers and offer them a free corporate massage when they recommend our service and it leads to a booking. The greatest compliment we can receive from our customers is a referral or recommendation. We appreciate any opportunity to assist your peers in other companies who could benefit from our corporate massage. We appreciate every recommendation very much and we reward you for it. As a gesture of our appreciation we offer your company a free massage. It depends how often and how frequently the recommended company books our corporate massage. For example; when a referred company books massages for a day we will offer you one-hour of free seated massage with your next booking. 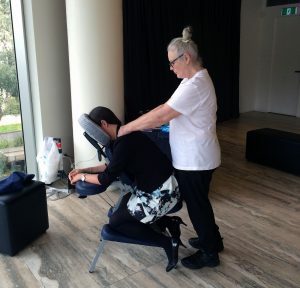 You can then offer your employees longer seated massages which can be a welcome treat. Or instead of an extra hour, you could choose to take one hour off your next invoice. It’s up to you! When your referred company books us for a year, we will send you one of our professional massage therapist for a day. How easy is that! You can also accumulate the free hours and book us for an extra day and rewards staff for their efforts when they finish a deadline or a project. Company’s social clubs who pay for their own massages can even use this recommendation benefit. The benefits of Corporate Massage are: a positive effect on your employee’s productivity; lower stress and absenteeism; improved morale and workplace loyalty. Our corporate seated massage concentrates on the back, neck and shoulders, these muscles suffer most from sitting for extended periods. Your employees will feel revitalised and ready to focus on their next task. Corporate Massage is a great way of rewarding your hard working staff and helping reduce stress and increase productivity.